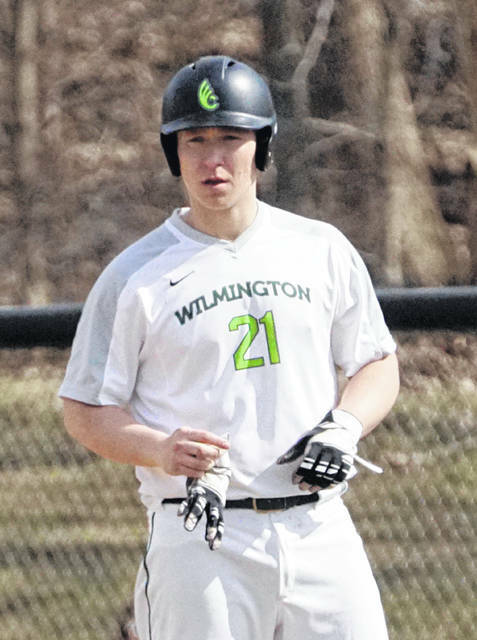 Gage Bley had a big second game at the plate for the Wilmington College baseball team. WILMINGTON – One bad inning prove costly for the Wilmington High School baseball team Tuesday in a 15-7 non-league loss to Xenia. “We had one bad inning that really hurt us,” WHS coach Brian Roberts said. Roberts said the Hurricane walked seven, gave up three hits and had two defensive errors. In all, the Buccaneers scored 13 runs in the inning, Roberts said. Wilmington had 11 hits with Jake Vaughan leading the offense with three hits and four runs batted in. Ben McAllister and Jeff Spears had two hits each. Joey Bush, Brock Rappach, Jordan Tackett and Matt Spears had one hit each. WESTERVILLE – Wilmington had early leads in both games but Otterbein prevailed in the end of an Ohio Athletic Conference doubleheader sweep. Wilmington goes to 6-19 overall and 2-6 in the OAC. The Quakers will attempt to snap their seven-game losing skid Saturday when they travel to Marietta College for an OAC doubleheader slated for 1 p.m.
Otterbein is 14-10 overall and 6-2 in the conference. In the opener, Wilmington held a 1-0 lead but that was short-lived as Otterbein scored in six straight innings for the easy win. Antonio Miller and Joey Allinder had two hits each for the Quakers. Lance Fleischman (2-5) was tagged with the loss. He gave up five earned runs in seven innings. Jarett Trautman finished and gave up four unearned runs in one inning. In the nightcap, the Quakers again took the lead. And again, the Cardinals bounced back quickly. WC scored four in the first, three coming on Gage Bley’s three-run homer, but Otterbein matched that then added six in the second. Wilmington eventually made it 10-8 in the ninth but could not get over the hump. Bley had two hits and scored three times. Joe Legin, Nick Silvis, Aaron Burns and Shane Hale had two hits each. Legin scored twice and Burns knocked in a pair. In all, six hurlers took the mound for the Quakers with Thomas Hueber getting the loss. Matt Oney pitched well in relief, going 2.2 innings. Trautman also came back with four strong innings. Neither Oney or Trautman allowed a run. LYNCHBURG – The Clinton-Massie baseball team defeated Lynchburg-Clay 6-3 Monday night in a non-league game in Highland County. The Falcons, 5-3 on the year, received a complete game pitching performance from Dom Kerns, who gave up six hits and three walks. He struck out one. Kerns also drove in two runs at the plate with a sacrifice fly and squeeze bunt. Tyler Lewis and Clint Stotts had two hits each. Stotts scored twice and Lewis drove in two. Coach Brian Camp said his team played solid defense in the win. (6) CLINTON-MASSIE (ab-r-h-rbi) Lewis 4-0-2-2 Chappie 3-0-0-0 Goodall 4-0-0-0 Kennedy 2-1-1-0 May 3-3-1-0 Branham 3-0-1-0 Kerns 1-0-0-2 Gragg 2-0-0-0 Gasaway 1-0-0-0 Stotts 3-2-2-0 Zantene 0-0-0-0. WILMINGTON – The Wilmington College baseball team wasted Jared Ferenchak’s strong outing Saturday as part of a doubleheader loss to Baldwin-Wallace at Tewksbury-Delaney Field. Ferenchak pitched 11 innings and gave up two earned runs but Wilmington lost in 12 innings 6-4. The Quakers dropped the second game of the Ohio Athletic Conference doubleheader 15-1. BW took a 4-0 lead in to the bottom of the eighth inning. Shane Hale scored on a wild pitch to make it 4-1. Gage Bley then led off the ninth with a double and scored to make it 4-2. Kyle Noble then tied the game with a two-run single to right field. Wilmington put a runner on second to lead off the 11th but failed to score. Ferenchak walked the first batter he faced in the 12th and was pulled from the game. After that runner was thrown out by Kasey Bottorf attempting to steal second, Baldwin-Wallace scored two runs to take a 6-4 lead. Jarett Trautman took the pitching loss for WC. Bley had three hits for WC while Noble had two hits and two RBI. In the nightcap, Aaron Burns drove in Bottorf for the only WC run. Jacob Griewahn was the starting and losing pitcher for WC. The Blanchester junior varsity baseball team was defeated by New Richmond 15-2 Monday. James Compton drove in a run and Justin Myers scored a run, coach Andrew Freeman said. “I believe we can be much more competitive than we were and must come together with a complete team effort the rest of the week,” Freeman said. On Friday, the Wildcats played Bethel-Tate in an unofficial game, Freeman said. The game ended in a 10-10 tie. Nate Moore and Wesley Moore both had hits for BHS. Wesley Moore drew two walks and scored twice. Nate Moore score one run.